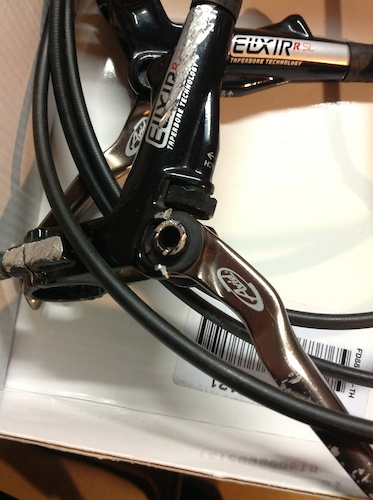 Avid Elixir R SL Hydraulic Brake Set from a 2010 Stump Jumper FSR Comp Medium Frame. Freshly bled from last year. Front brake works perfect, only defect are surface scratch. Rear brake also works great, but there is a broken piece where the lever pivots on one side only. Never had a problem with it last year, but that is the reason why I have a price that low. Both brakes have surface scratches as per pictures. What is included is shown in the pictures (rotors not included) Buyer pays for shipping Thank you!